Ketchikan, Alaska - By all accounts, it was one of the largest traffic jams in Ketchikan's history. Hundreds of cars plugged Tongass Avenue as more than 3,000 residents tried to reach the Ketchikan Marine Highway System Terminal in the Charcoal Point area north of Ketchikan's West End, according to the Ketchikan Daily News. But it wasn't a mass exodus that spurred the commotion, it was an arrival. 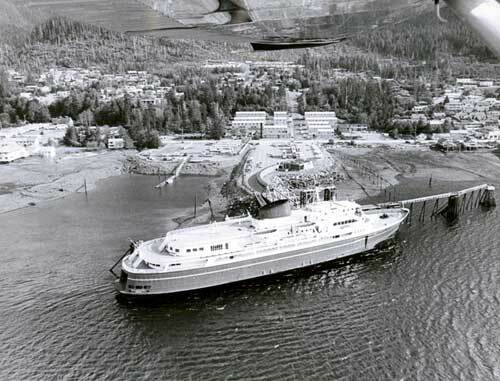 The first arrival of the brand new state ferry Malaspina on Jan. 23, 1963. Ketchikan - and the rest of Southeast Alaska - had been without regular passenger ship service for nearly a decade, since the Alaska Steamship Company stopped passenger service in 1954. Although air travel was increasing, the Panhandle was generally more isolated than it had been since the early part of the century and Ketchikan residents were thrilled that newly minted State of Alaska was moving to ease that isolation. The genesis of the Alaska Marine Highway System was some 14 years earlier, in 1949 when Steve Homer of Haines started a commercial ferry on Lynn Canal. Homer - together with Robert Sommers and Associates - purchased a surplus World War II Navy LCT that he christened the Chilkoot. The 100-foot-long vessel could carry 13 autos, 20 passengers and had a crew of seven. It had a day lounge, lavatories, a galley and crew quarters and steamed up Lynn Canal at about nine knots. Chilkoot Motorship Lines operated from Tee Harbor - 18 miles road miles north of Juneau - to Haines-Port Chilkoot and Skagway, according to Stan Cohen's 1994 history of the Marine Highway System "Highway on the Sea." The Chilkoot generally made one trip a week, but could make more if traffic warranted. Although Skagway was connected to Whitehorse, Yukon Territory by the railroad in those days, the real Southeast connection to the outside world was in Haines, where a road connected up with the Alaska Highway at Haines Junction, some 150 miles north of Haines and Chilkoot Motorship hoped to tap into the need to access the territorial capital with the rest of the state. But the single ship operation proved too expensive relative to the cost and Chilkoot Motorship convinced the Territorial Board of Road Commissioners to take over the service in 1951. In early 1951, word began to come from Juneau that the territorial government was interested in building a large passenger vehicle ferry for the Seattle to Alaska Inside Passage. A New York/Seattle naval architecture firm even came up with a preliminary design of a 407 foot "fast" ferry that could hold four hundred passengers - in two classes, luxury and commercial - as well as 45 vehicles. It would even had a deck below the car deck specifically designed to load and unload up to 31 rail cars. The "fast" ferry would travel at 18 knots. But several years of discussion and financing plans came to naught. The Chilkoot continued to operate the Lynn Canal run for another six years, when the territorial government decided to build a new but smaller ferry than had been proposed. The Chilkoot was sold for $37,000. The MV Chilkat was 99 feet long and could carry 59 passengers and 15 vehicles. It was built by J.M. Martinac Shipbuilding Company in Tacoma for just over $300,000. Its distinct bow ramp meant it could load from the beach as well as a dock. It was painted in the now common blue and gold colors of Alaska's flag and almost instantly dubbed the "Blue Canoe." In June of 1957, the Chilkat began daily service between Juneau and the communities on Lynn Canal. Interest in ferry service to the rest of the communities in Southeast remained high and after Alaska became a state in 1959, voters approved bond issues totaling $18 million dollars to expand the ferry fleet. Three million dollars went for docking facilities and a new ferry for the Kenai Peninsula-Kodiak area. The rest was for three ships and seven docks in Southeast Alaska. 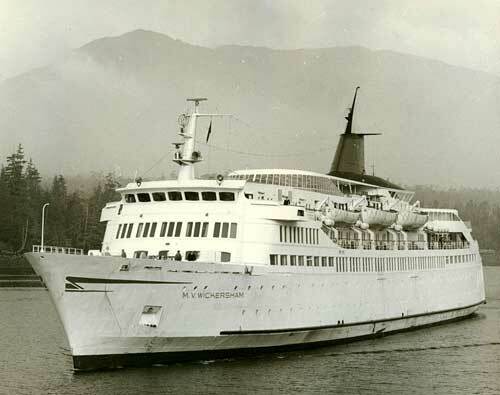 The first of the new ships to go into service was the Malaspina in January of 1963. It was designed by Philip Spaulding and built at Puget Sound Bridge and Dry Dock in Seattle for $4 million. The 352 foot long ship had room for 500 passengers and more than 100 vehicles and cruised at 18 knots. In April, the Taku went on line, followed by the Matanuska in June. The Taku had a somewhat inauspicious start. Within weeks of its delivery, it hit a rock approaching the Petersburg terminal, damaging a 70 section of its hull. It returned to service in May, but then had another "accident." "Less than three months later, more back luck hit," Cohen wrote in his book. "again at Petersburg, two boys, aged 10 and 15, dashed into the wheelhouse, slammed on the controls and ran out. With her engines idling, the ferry was about to cast off. She surged forward, crashing into the two 75-foot counterbalance towers. Twisting and breaking from the impact, they dropped the 180-foot loading ramp into the water. It took three months to repair the terminal." The boys were from San Diego and were traveling with their parents on the voyage. The parents were fined $500 for the boy's actions, the maximum allowed under Alaskan law at the time. Repairs to the ship and the dock totaled more than $1 million. The Taku also suffered an even worse accident in 1970, when it ran aground on West Kinihan Island island near Prince Rupert after missing the turn into the harbor. Photos of the time show the vessel with its bow up into the trees on the small island. Passengers and most of the vehicles were offloaded onto the Canadian ferry Queen of Prince Rupert, and for time it was thought the Taku might capsize, but it was safely pulled off the island and went to drydock under its own power. With three "mainline" ferries in operation between Prince Rupert B.C. and Skagway in 1963, the Chilkat was moved to Prince William Sound for the Cordova to Valdez run. 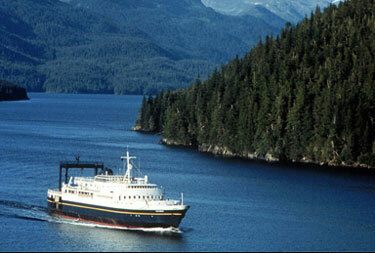 In 1964, the fourth new ferry, the Tustemena, was added to the fleet on the Kodiak-Kenai Peninsula Route. The $3.5 million Wisconsin built ship was originally 240 feet long and carried 200 passengers and 40 vehicles. The "Trusty Tusty" also had a unique loading elevator on the stern that would allow vehicles and cargo to offloaded at any dock without a loading ramp. Alaska Marine Highway Ferry Tustemena. Unfortunately, the Tustemena's original design proved to be prone to significant rolling in the Gulf of Alaska. In 1969, it was sent back into the shipyard and lengthened by 56 feet which significantly reduced its propensity to roll in rough water. After the Good Friday 1964 Earthquake, the Chilkat was shifted to the Valdez-Whittier run. And then in 1969, it went back to Southeast for the Juneau to Hoonah run. In 1977, it was put on the Ketchikan-Hollis-Metlakatla run. In 1988, Alaska's oldest "ferry" was sold and - up in the early 2000s - was still part of the regional fishing industry. 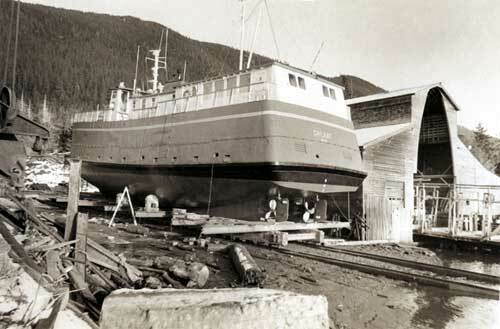 In 1969, the state built a small ferry, the E.L. Bartlett for the Whittier, Valdez, Cordova run. The $3.2 million ferry was built by Jeffboat in Jefferson, Indiana. The 193-foot-ferry had a capacity of 190 passengers and 41 vehicles and traveled at 12 knots. It was the first state ferry to not be named after a glacier. Longtime political leader "Bob" Bartlett had recently died and it was decided to name the boat after him. The Bartlett would operate, primarily in Prince William Sound, until 2004 until it was surplused by the state and eventually sold for nearly $400,000 on EBAY. By the mid 1960s, the state was looking to expand ferry service down to Washington State. Problems with the Canadian Ferry system and rockslides on the highway out of Prince Rupert finally convinced Alaska to move it terminus south. Seattle and Bellingham held a spirited battle to be the terminus of the new service. Seattle won out in 1967, but Bellingham had the last laugh when the AHMA terminal was moved there in 1989. The biggest challenge in providing the new service was that the route from Prince Rupert to Seattle was classified as "oceangoing" and none of the three mainline Alaskan ferries were considered legal for ocean routes. The state solved this problem by sending a ferry to Seattle and then asking the federal government to reclassify the route as inland passage, which it did. But the state still wanted a new ferry that would better handle the open water along some of the route. Construction of a new boat would take several years and cost up to $10 million. So the state purchased a new 363-foot, 1,300 passenger ocean going ferry for $6 million in Sweden called the Stena Brittanica. The ship was rechristened the Wickersham, after early Alaska judge and political leader James Wickersham. But the plan immediately ran afoul of a decades old maritime law called the Jones Act. The Jones Act - enacted in 1920 to protect US shipbuilders - prohibited foreign built ships from carrying goods or people between US ports. From 1968 to 1972, the ship could only operate between US ports if it stopped in Prince Rupert . 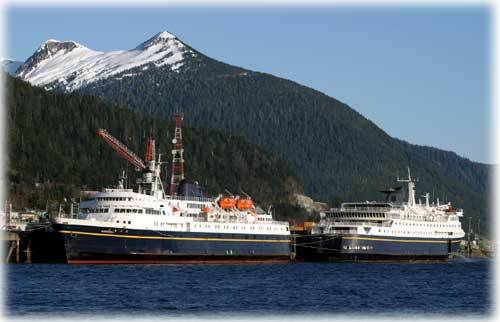 Its bow loading system also limited its Alaskan service to Ketchikan, Juneau, Sitka and Haines. The deep draft of the Wickersham also made it impossible to traverse narrow, shallow areas like Peril Strait near Sitka. In the winter, that led the ferry to take some adventurous stormy trips in the open ocean on the outside of Baranof Island and elsewhere. Despite the challenges in deploying the Wickersham, passengers generally liked the foreign ship. While its accommodations were not luxury, they were certainly of a fancier nature than the other, more utilitarian members of the fleet and the ship was an excellent sea boat. In 1972, a formal waiver for the Jones Act was obtained from Congress, but only because the state had already started construction on a replacement ferry for the Wickersham. In 1974, the Columbia went on line as the largest ship in the fleet. The 418-foot, 1,000 passenger ship was built by Lockheed Shipbuilding in Seattle for $22 million. The Wickersham was sold. 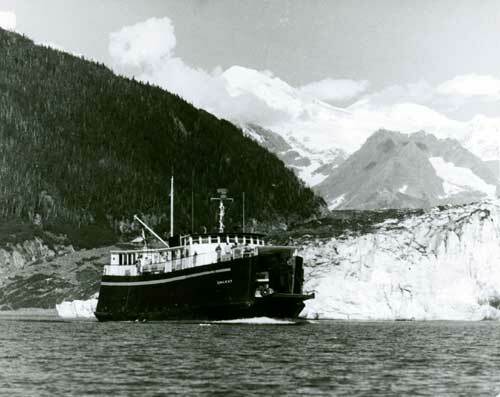 In order to increase capacity - and not build additional ships - the state also lengthened both the Malaspina and the Matanuska by 56 feet to 408 feet in the 1970s. But as the mainline ships got larger, it became harder to serve some of the smaller ports in Southeast. Two smaller ferries, the LeConte (1974) and the Aurora (1978) were built in Wisconsin. The 235 foot boats, 250 passenger, 444 vehicle boats cost $4.5 and $7.7 million. The LeConte served the Panhandle north of Petersburg and the Aurora served Southern Southeast including several unsuccessful attempts to establish service to Hyder, Alaska and Stewart, B.C. at the head of Portland Canal. For the next decade, the Marine Highway System stayed generally status quo. But shortly before the turn of the century, major changes were in store. By the mid 1990s, the original three vessels were coming to what officials believed to be the "end of their useful lives." The Exxon Valdez oil spill in 1989 had also shown that the state needed a better large scale emergency response system. It was decided to build a new $80 million ocean going ferry that would also serve as a mobile emergency response center. It was a big task, particularly in light of the fact that no one had built a large passenger ferry in the United States for nearly two decades. The contract went to Halter Marine in Mississippi in 1995 and the ship was completed in 1998. But there was controversy during the construction and Halter Marine sued the state for an additional $46 million, claiming that changes had altered the scope and hurt the company. The state countersued because the ship was delivered late. Eventually, the company filed for bankruptcy and the state settled the lawsuit by paying a subcontractor $500,000. M/V Fairweather in winter lay-up in Ketchikan. The 382 foot, 750 passenger, 120 vehicle Kennicott immediately became the most versatile ship in the fleet, making stops at every port from Bellingham to Dutch Harbor in the Aleutians. Although its final design didn't win many kudos from residents, it proved to be a fine handling ship for Alaskan waters. Also in the 1990s, the state government was also looking to cut the annual $40 to $50 million state subsidy for the AHMS. Plans were developed to make the service cheaper and more efficient. 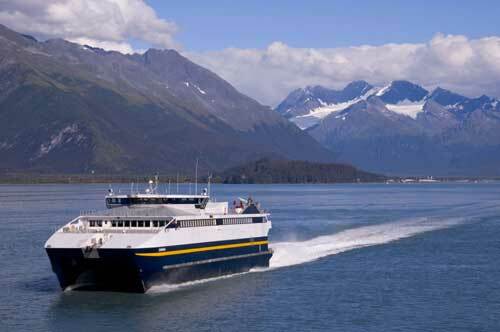 The first involved the use of "fast" ferries to shorten the runs in Southeast and Prince William Sound. The original plan called for four fast ferries to built and gradually replace all but one or two of the mainline ferries. Once again the Jones Act reared its head. Before construction of the fast ferries began, the British Columbia ferry system announced it was going to surplus several of its fast ferries, potentially saving Alaska millions of dollars over building new ones. But since the Canadian ships had not been built in the US, they would still not meet the Jones Act requirements and Alaska's Congressional delegation warned the state that it would be almost impossible to overturn the Jones Act or get a permanent waiver. Derektor Shipyards in Connecticut got the contracts for the first two 240-foot, 250 passenger, 35 vehicle catamarans. The fast ferries would travel at nearly 40 mph, about twice as fast as any of the mainline ferries. The first ferry, the Fairweather, began operations in 2004 and the second, the Chenega in 2005. But both have been controversial because they have been unable to operate in the region's most harshest weather and have had more mechanical trouble than expected. In February of this year, the state announced that the fast ferries would be laid up next winter and that it would not build the two additional proposed fast ferries. The state meanwhile was also looking at plans that would change Southeast routes and require fewer larger ships. Those plans would call for more roads and several smaller terminals to be built in order to turn the system in a combination of roads and shuttle ferries. Some mainline ferries would be retained but most of the ships in the fleet would be surplused under that plan. There have also been changes to some of the feeder ferry routes in recent years, particularly in the Ketchikan area. Both Prince of Wales Island and Metlakatla complained for years that the AMHS ignored their calls for more reliable service. Eventually, POW developed its own ferry service, which now has vessels going to both Ketchikan and Wrangell/Petersburg on a daily basis. 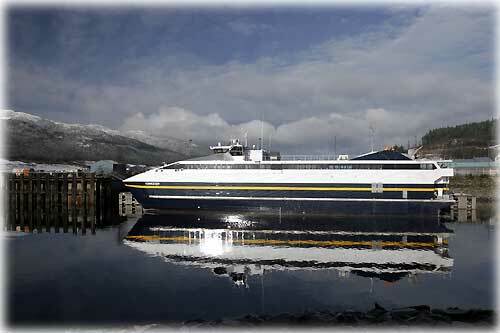 And the AHMS specially built the 180 foot, 149 passenger, 18 car Lituya for the Metlakatla run giving it daily service. Those changes allowed the state to move the Aurora to Prince William Sound. For the time being, the state has decided to not surplus any of the rest of its aging fleet for the foreseeable future. In 2004, it announced a plan that would call for a fleet reduction from five mainline ships to three in 2010, but only if progress is made to connect Juneau to the Haines/Skagway road system and a road is built across Baranof Island to improve access to Sitka. In the meantime, the Alaskan Blue Canoes continue to ply the waters of the state, making sure that isolated communities stay connected, oblivious to the winds and waves being churned up by the successive state governments.